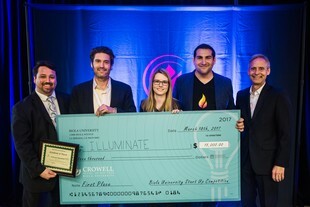 Four teams of student and alumni entrepreneurs received more than $25,000 in cash prizes at the Crowell School of Business Second Annual Biola Startup Competition on Saturday, March 18. Each team’s proposed business ideas focused on different aspects of daily living. Teams Illuminate International, Wevene.com, Raptor House Effects, LLC., and Lift placed in the competition. Illuminate International, an innovative publishing house that will focus on children's books that tell diverse and multicultural stories, won the first-place prize of $15,000 as well as a legal package valued at $10,000 from Brown & Streza, LLP. The sales of the children's books will go towards funding their education empowerment initiative, which provides sustainable empowerment of local educators in developing countries. They hope to begin their education initiative in Kenya. The members of Illuminate International are business administration major Jordan Perkins, alumnus John Terranova (’13), and human biology major Karina Bodemeijer. Team members senior business major Perkins and Terranova first met at a Bible study after Perkins had recently returned home from a trip to Kenya. The conversation sparked a question on how to best use social entrepreneurship to change the world. A year later, Perkins and Terranova went back to that first conversation to brainstorm ideas that combined both Perkins’ and Terranova’s passions of education and nonprofit work. Next January, the team plans on flying to Kenya to meet with an organization to begin the process of sending educators to local schools and to start curating stories of local tribes to bring back to artists in America. Wevene.com won the second-place prize of $7,500. The startup service helps brides-on-a-budget find local vendors to plan their ideal wedding. The members of Wevene.com are alumnus Austen Dutton, Eugenia Dutton, public relations major Melissa Altamirano, business administration major Kalison Nix. Raptor House Effects LLC won the third-place prize of $5,000. The team of special effects artists serves clients in film, television and internet media. The members of Raptor House Effects LLC are alumni Jesse Velez and Cameron Boyce, accounting major Keaton Kerr, and cinema and media arts majors Melissa Velazquez and Asa Borquist. Liftd, a group that hopes to reinvent the shower caddy to promote self-care among young women, won the fourth-place prize of $1,000 in services from startup incubator Wayfare. The members of Liftd are business administration majors Melissa Sugeng, Megan Harlander, Clarissa Rusli, alumna Tricia Sada. Two teams that were also finalists were Columbus International, a social media platform for Sino-American student exchange programs and MissionLink, a group looking to bridge the gap between missionaries and their home churches. The competition consisted of three rounds and began with a kickoff event in September. In December, the registered teams were narrowed down to the six finalist that presented their final pitches before four judges on Saturday. The Biola Startup Competition is a faith-based entrepreneurial initiative hosted by Biola's Crowell School of Business to accelerate startups across Biola University. The competition was open for all current Biola students and recent alumni (2006 or later) to compete. The judges were Russell Bjorkman, venture partner of Sovereign’s Capital; Charles Hu, co-founder of Fishermen Labs; Ruth Lopez Novodor, CEO of Beverly Oncology and Imaging Centers and Wes Wasson, CEO and co-founder of DreamStart Labs. Written by Peter Bradley, iBiola Reporter. For more information, contact Jenna Loumagne, media relations manager, at (562) 777-4061 or jenna.loumagne@biola.edu.